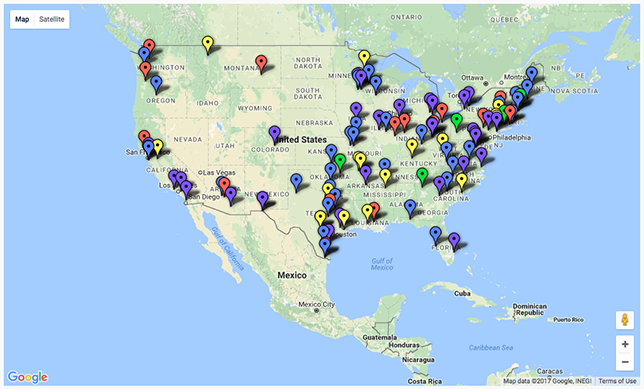 Ed Tech Strategies, a Virginia-based research and counsel consultancy, has published a K–12 Cyber Incident Map, an interactive visualization of cybersecurity-related incidents reported about United States K–12 public schools and districts from 2016 to the present. From the period of Jan. 1, 2016 to March 29, 2017, U.S. public schools experienced at least 105 separate cybersecurity-related incidents resulting in the disclosure of personal information, the loss of taxpayer dollars and the loss of instructional time, according to Ed Tech Strategies’ website. Some of these incidents have resulted in identity theft, as well as criminal charges for the perpetrators. The K–12 Cyber Incident Map is interactive and actually extremely sensitive to mouse or trackpad touch. One can shrink or enlarge the map, or click on a pin, which provides a summary of information about each specific incident, including the year the incident became public, the school or district involved, the incident type, a brief description of the incident and the source of the data about the incident. For example, at Hanks High School in El Paso, TX in 2017, confidential information belonging to the high school’s students might have been compromised after a laptop containing transcripts of every student at the school was stolen. The source for this incident was the media, as reported by DataBreaches.net. “As public education increasingly relies on technology for teaching, learning, assessment and school operations, it is imperative that effective policy and practice is in place to protect children and youth, as well as taxpayer-funded equipment and services,” states the site, which is operated by Douglas A. Levin, founder and president of Ed Tech Strategies. Levin served as executive director of the State Educational Technology Directors Association (SETDA) from 2009-2015, and helped develop and implement the nation’s first education technology plan and strategy under President Clinton in 1996. He also assisted in subsequent updates under President George W. Bush in 2000 and 2004, and consulted President Obama on the development of the 2016 plan. The map data comes from extensive online searches and consultation with experts, the site states. The Privacy Rights Clearinghouse maintains a database of public breaches that includes some information about school incidents. Databreaches.net offers the most extensive history of education-related incidents, the Ed Tech Strategies site says. To view the map, visit the Ed Tech Strategies website. To report an incident, contact Levin at dlevin@edtechstrategies.com.